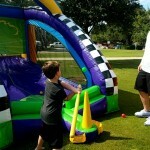 Inflatable baseball games are a great choice for any sports themed party or event! This games compact size makes it a wonderful option for indoor events with limited space or for your back yard birthday party. This game is perfect for players of all ages from kids to adults! 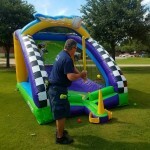 Bring the ballpark to your party with Jump City’s baseball game! Reserve This Inflatable Game Now!